SIMON LAKE. Partially Printed Document Signed. 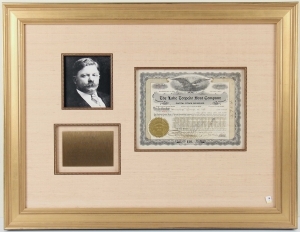 Stock certificate No. 2310 for five shares of Preferred Stock in The Lake Torpedo Boat Company. Bridgeport, CT, June 28, 1917. Boldly signed. Attractive gold and silver foil ornate borders with corporate seal and eagle vignette at top center. 1p. 11” x 8½”. Archivally framed. Simon Lake (1866-1945). Naval inventor who built the first submarine to operate extensively in open sea, the Argonaut.